Dr. Karen Rabren, Director of the Auburn Transition Leadership Institute, presents the ATLI annual report on November 14, 2014. 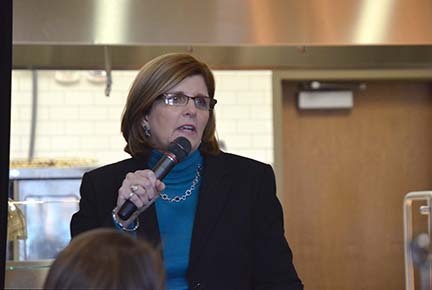 The Auburn Transition Leadership Institute (ATLI), which is part of the College of Education, presented its FY 2014 annual report on November 14, 2014, at a luncheon in the new Wellness Kitchen on the Auburn University campus. In addition to the truly delicious food, those gathered in the Kitchen’s conference room enjoyed presentations on the Institute’s instruction, research, and outreach efforts for the prior fiscal year. Center Director, Dr. Karen Rabren, introduced special guests and defined transition as it relates to youth and young adults as they move from the school system into work or higher education. Dr. Rabren went on to note that the ATLI engaged over 10,000 people through its projects and activities in the past twelve months, and to show how the ATLI annual report focuses on three federal indicators and is in line with the Auburn University Strategic Plan. The instruction and outreach portions of the report were made by Courtney Dotson, Instruction Coordinator, while Research Coordinator, George Hall, presented ATLI’s research for the year. This focused largely on the importance of having work experience while in school, and the work being done to gauge satisfaction by parents with services in the school and the community. ATLI graduate assistants Brooke Joplin, Theresa Chan, and Jonathan Carpenter also made presentations based on interviews they conducted throughout the year. The program concluded with a preview of the 25th Alabama Transition Conference by Outreach Coordinator, Tiffany Frasier-Rocker. The conference is scheduled for March 2-4, 2015, at the Marriott at Grand National in Opelika. To learn more about transition and ATLI initiatives, visit the Institute’s website at https://web.auburn.edu/institute/.